We can also take care of your pass purchase at the studio when you come to class - cash is preferred for in-studio purchases but we can take card payments if necessary. Please review all conditions (especially the expiry dates for 5 and 10 class passes) before purchasing. Passes are non-refundable and non-transferable. Passes cannot be extended or suspended. Passes are valid for ongoing yoga classes only (not workshops and special events). 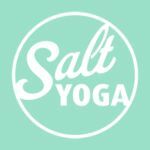 Salt Yoga reserves the right to make changes to the timetable at any time. By purchasing a pass you are agreeing to these terms and conditions and any additional restrictions on individual passes (click on a pass name to find out more).